You know what it’s like. You come up with a grand plan to do something and within about ten minutes your bold vision has all gone to pot. 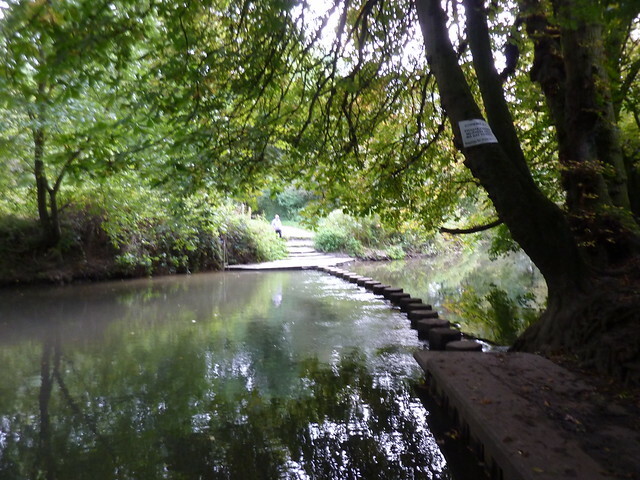 My plan to walk the North Downs Way in between job applications and interviews had started well with two days of walking at the end of August but September came along and suddenly it was all thrown out of the window. The people at the Job Centre wouldn’t have minded about my change of plan. September had simply been busy. If I wasn’t actually doing an interview, I was preparing for them or fending off phone calls from recruitment agents. One week I ended up doing four interviews, whilst another I did one with just three hours notice. My stress levels reached their highest rates for ages. I desperately needed to get out and relax but there was just no time available. Job hunting was far harder than I remembered. Then, on 3 October 2011 the phone call came that would end it all. The one that said “We’d like to give you the job”. It was a good sounding job. A very good sounding job. The interview had been great, the people seemed wonderful, the money good. Everything seemed perfect. But I was in a quandary. I still had other interviews lined up, including one that could also be very good even if they had messed me around a bit in trying to arrange the interview. Should I still go to those interviews? Keep my options open? Or should I just accept this job which seemed like perfection on a plate? ARGH! Decisions! I wandered round the house in confusion. Just what to do? But I couldn’t think. I needed to get out of the house. A change of scenery would help me work it all out. Which is how I came to find myself wearing a pair of hiking boots back at Box Hill and Westhumble station, my mind whirring with options and decisions. Not that there was much time for such distractions as the North Downs way immediately hit me with a set of stepping stones to cross over the River Mole, before introducing me to the breathless climb of Box Hill. “No one can do it without stopping,” Catherine had challenged me the night before and she wasn’t wrong. I found it impossible but mainly because the combination of physical exertion and a hot, muggy October day meant I had to resort to removing my shirt three quarters of the way up. Box Hill is quite possibly the steepest climb of the whole North Downs Way but once up there it’s worth every last gasping wheeze, even if you are basically looking at Dorking. Well not just Dorking. Off in the distance sat that other mighty backbone of southern England: the hills of the South Downs. For a brief moment the worries and conundrums seemed rather irrelevant as I was presented with a view that just seemed right. And then the North Downs Way headed off down a tree-lined track and my mind was racing once more; my brain barely taking my surroundings in as options and debates raged inside my cranium. The site that once housed Betchworth Quarries now is home to a wildlife reserve, residence to group of goats who munch away the Buddleja that would otherwise choke off several rare plant species needed by various rare insects. Nearby an old lime kiln stood tall, raised high off the hillside and it was there I made the call both metaphorically and literally. Hello. How are you doing? Yes. I would take the job. When can I start? Soon. Very soon indeed. And with that my mind cleared, I began to start taking the North Downs Way in properly. Had I not I may have missed the tombstone by the side of the path; a memorial to a racehorse called Quick who lived from 1936 to 1944. The simplicity of the horse’s name a stark contrast to such modern versions like Platitude Queen and Zeinab Badawi’s Twenty Hotels. A short stroll up the lane at the village of Betchworth led on to a path that would take me to Colley Hill where, turning a corner and climbing up hill slightly, I was suddenly confronted with the loud noise of the London Orbital Motorway; the delight of the M25. Create a walking route across the South East of England and you’re going to encounter roads and motorways in greater abundance than you would in any other part of the country but the North Downs Way suffers more than most with huge chunks of its route being within a mile or so of various mega roads. The M25 was just the start. Later sections would add the M20, the M26 and the M2. Peace and quiet the walker will not always get. It would take a few miles before the London Orbital would come into view. Instead Colley Hill offered fine views looking down on Reigate; far more interesting than a view of lorries and cars any day. 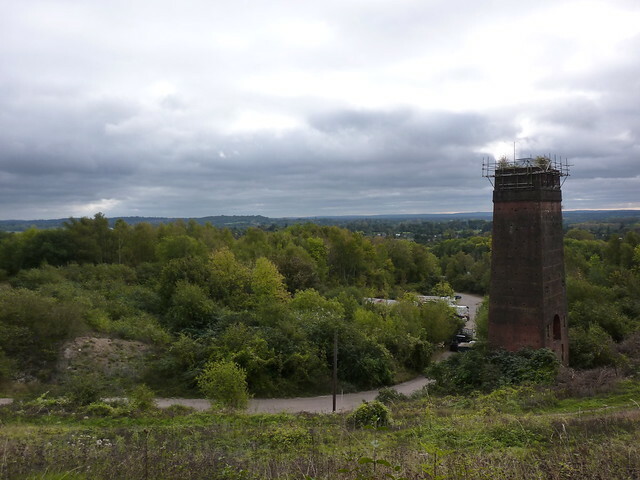 The views from the North Downs ridge were not just useful for sightseers, as the remains of Reigate Fort showed. Built in the 1890s it was a simple construction, erectedwhen confidence in the British Navy was at a low. In order to protect the country from potential invasion a network of 13 forts along the south east of England were built. Little more than a series of underground bunkers, the forts were not strategic positions in themselves. Instead the idea was that the army could dig a network of trenches and spread themselves out. 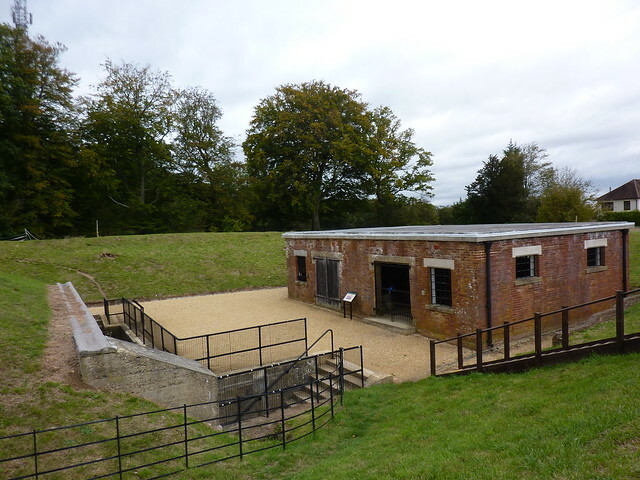 The forts would co-ordinate activity and serve as an ammunitions store. Their existence was brief and the whole network was shut down and sold off in 1907. 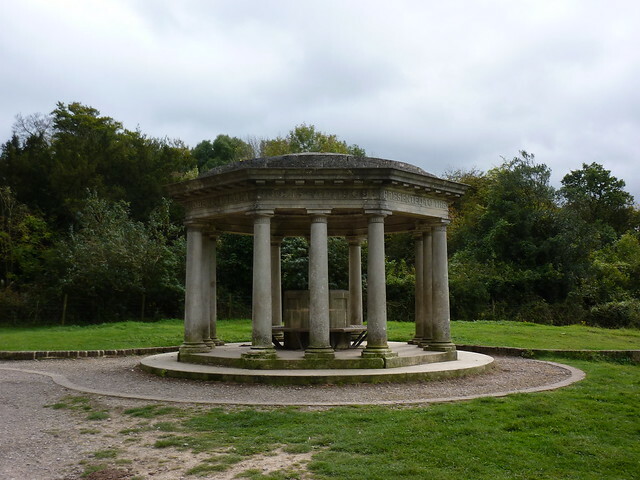 After various ownership, including a brief stint with the Scouts it came in to the hands of the National Trust and in recent years has been restored and repaired; a tribute to the somewhat hidden national defences of another century. A footbridge took the route over the A217 road and into a car park where a coffee stand soon had me parting with some money in exchange for a cup of tea and a vaguely boring Smarties based cookie whilst admiring the view of Redhill in the distance. From there the North Downs Way rather oddly led me through the grounds of a boarding school and then alongside the almost inevitable golf course where, finally, the M25 came into view. Down below I could see the town of Merstham and beyond, a series of raised flyovers where the M23 crossed over and interchanged with the other motorway. The traffic noise was almost deafening and I made a mental note to bring ear defenders for the next section as I hot footed it in to the town and to its small railway station. Soon I’d be home, filling in paperwork for my forthcoming new job. Next time: I forget to bring ear defenders, and manage to walk twice as far as I intended to as the North Downs Way hits a section of motorways and roads. The whole North Downs Way adventure is available to read now for Kindle, iPad, iPhone, Kobo, and Google Play or other e-readers. Really enjoying these, keep them coming. So far your sections have matched mine so hopefully the next stage will be subtitled: Knocking off in Knockholt! And I really need to get back to Chilham to get the last couple of days done. How did you get the figure of 10 miles I wonder? It seems to be received wisdom that this stretch is 10, but yesterday a friend and I hiked Merstham to Box Hill and it came out as much further. She wears a FitBit and it said 14 miles exactly, and I think that’s accurate. Whole hike took us 7 hours (we ain’t hugely fit and it was murderously muddy in patches) and we got to Westhumble station at nightfall. I would have taken it from the official North Downs Way guide book which gives the stretch 10.1 miles – that’s taken from the A24 rather than Box Hill station, but that doesn’t add on too much. I don’t know anything about the Fitbit so I took a little look. By the looks of it it doesn’t have GPS so does an estimate on the distance it thinks you’ve done rather than what you actually did. Whilst the reviews I’ve read say it’s reasonably accurate, it’s possible in your case that it wasn’t. Either that or you took quite a lot of wrong turns! Of course calculating distances on the computer isn’t spot on perfect but I obviously don’t know how the guide book calculated their distances. Although I doubt they went out with a trundle wheel. You’ll have to excuse my Luddite tendencies here, GPS is satellite tracking isn’t it? Fitbits have got that. I think the 14 miles is accurate but possibly doesn’t include from the top of Box Hill to Westhumble station for example, which is probably getting on for a mile. I’m guessing also that the route having been planned out on a computer, it won’t include all the meandering you do when you actually walk it. 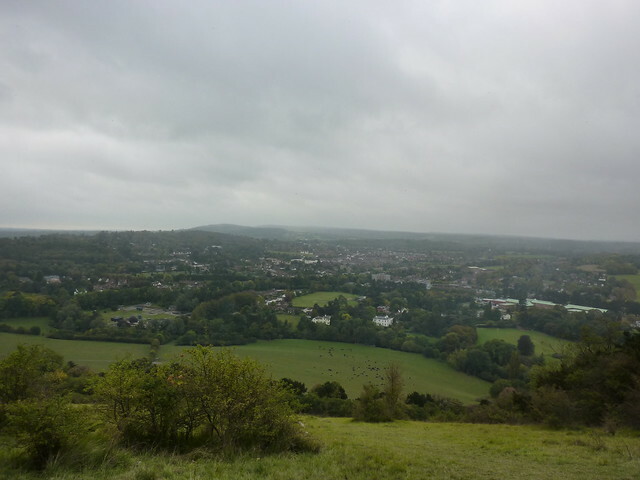 Any way, no matter, and I’m hoping to walk it again once the weather brightens up, from the Box Hill end this time. Be interesting to see how far it come out as. The review I read said it didn’t have GPS but maybe either the review was wrong, or there’s different models. When I did my measurements on Memory Map I took it from the A24 near Boxhill to the A23 at Merstham. You’ll add on a short amount on either side to get to the station, but not more than a mile or so in total looking at the map. Based on what I walked that day, 10 miles seems about right to me – and it tallies with what I measured on the computer. A few years late to this but I am walking the North Downs Way at the moment and have been finding your blog very helpful. Just wanted to clarify in relation to the discussion above – I walked from Box Hill station to Merstham station last weekend, measuring it on a brand new Garmin Fenix 3 and we walked a total of 10.8 miles with no major detours from the route. Hi Fan – the gravestone refers to Quick being a “thoroughbread” which automatically makes you think of a horse. I do see there’s been a few references online to Quick being a greyhound, but it’s difficult to find a definitive source! First Published: 18 January 2013. Last Updated: 16 November 2014.